Simon & Schuster, 9781476774046, 304pp. The poignant story of a boy’s coming-of-age complicated by Williams syndrome, a genetic disorder that makes people biologically incapable of distrust. Jennifer Latson has written for The Boston Globe, the Houston Chronicle, and Time. She received an MFA in creative nonfiction from the University of New Hampshire and was a recipient of the Norman Mailer Fellowship for nonfiction in 2013. The Boy Who Loved Too Much is her first book. "[Latson's] prose is fresh and engaging, her story leavened with humor to take the edge off the ongoing struggle of characters we have come to care about deeply. It would be a mistake to squeeze this book into the "disease narrative" genre. It transcends that niche, partly through the author's reflections on what our reactions to people with Williams Syndrome have to say about the human condition." "[Jennifer Latson] skillfully interweaves the science—what we do and don’t know about genetic disorders such as Williams—with a powerful story line. Eli and especially Gayle are beautifully drawn, and their struggles with an unknown future are both unique to their situation and universal to all parents. As the book’s perspective deliberately pans out to include teachers, counselors, family, friends, and, finally, Eli’s entire eighth-grade class, Latson delivers some unforgettable lessons about inclusion and parenthood." "[Latson's] book provides a thorough overview of Williams syndrome and its thought-provoking paradox. No doubt life for people with Williams (and those who love them) has its difficulties. But given the state of the world today -- the hate attacks, the divisiveness, the vitriol -- it's hard not to wish that we all had more kind-heartedness and openness, even if our embrace of other humans is only metaphorical." "The narrative is alternately moving and heartbreaking, as Latson walks readers through the tumultuous obstacles that Eli and Gayle face daily. Throughout, Latson demonstrates a sharp, journalistic eye for telling detail and the ability to capture poignant moments without resorting to cliché or overly sappy writing...In this balanced, readable work, Latson effectively and sympathetically captures Eli’s essential humanity and opens a clear window on a little-understood genetic disorder." "The book could have been exploitative, but instead it’s a moving portrait of a mother facing the fact that her child has a different future from the one she imagined...The fascinating journey shows D’Angelo’s mother learning to accept Eli’s differences – and those differences lessening as he matures. I only wish I could find out how their story pans out." "Latson tells [this] story with great sympathy and eloquence, giving voice to the frustration, anguish, and despair a parent feels when their child struggles with a rare disorder. A well-researched, perceptive exploration of a rare genetic disorder seen through the eyes of a mother and son." 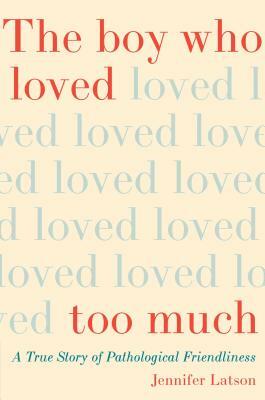 "The Boy Who Loved Too Much is an astonishing debut. Before the book crossed my desk, I’d never heard of Williams syndrome, and once I started reading, I could think of little else. This is narrative nonfiction of the highest order—rigorously reported, elegantly told, and nearly impossible to put down. Always empathetic and consistently insightful, Jennifer Latson’s deep dive into Eli’s life not only illuminates an under-known condition but made me rethink the very nature of human connection. I cannot recommend this book highly enough."